Ed is known for casting and introducing new actors including in this film Kerry Bisheé and Matt Bush. In this video we thought it would be cool to interview Eddie in front of a Wurlitzer Juke Box. 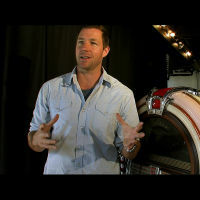 Ed Burns was the recipient of the Grand Jury Prize at the Sundance Film Festival in 1995 for his film The Brothers McMullen. He's still at it. And very much still an independent filmmaker. His latest film Nice Guy Johnny is his most personal film since 1995. A story about a guy who has to decide if he should keep chasing his dream or go get a real job. Ed Burns. Writer. Director. Actor.